The Opel Manta A series is probably one of the two best looking models Opel produced; the other being the original Opel GT sports car. If the bodywork had been made of fibreglass, aluminium or stainless steel, it would have been a distinct improvement though. The Manta body shell is a typical GM monocoque design but is more complex than its contemporaries and hides rust well, which is not a good thing. 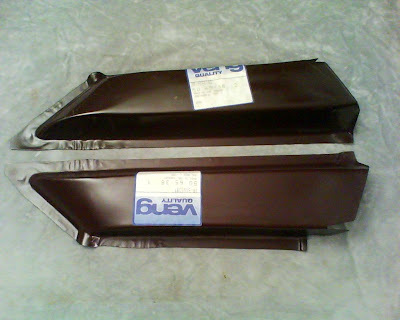 Mick and Caroll are busy rebuilding their Manta A series and have been able to source replacement inner wings from a German company. Not included were the braces which mount to the outside of the inner wings and can be quite a rust trap. I had a single pair of repair sections left in stock, these were sold under the Veng brand here in the UK up until the late 1990s. Unusually for pattern parts the finish is very good, with an attractive spray painted finish. Much better than the usual dipped matt black paint.